Work Less, Make More Money! Are you caught in the entrepreneurial trap of doing countless different activities every day instead of doing what you love to do, are best at, and actually brings revenue into your business? When was the last time you took a day off and went back to work with a clear mind, refreshed and raring to go? Do you have protected planning time to work on growing your company, get prepared for important presentations, or learn a new skill—even time to plan a great day off? Every entrepreneur has freedom around how they use their time. But not many can take advantage of this potential results multiplier because they’re too mired in the day-to-day of running their business. 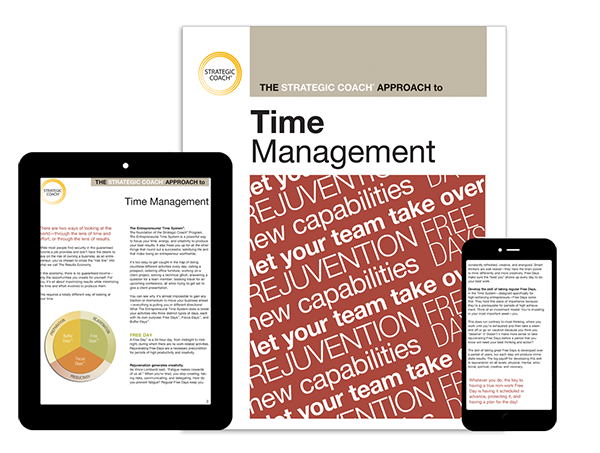 The Strategic Coach Entrepreneurial Time System® is designed specifically for entrepreneurs. It’s a time system built on the truth that, unlike those who work in a time-and-effort economy, an entrepreneur’s success depends totally on results. This requires an entirely new way of organizing your time. Learn how the three distinct days that make up the Time System change the focus of your time and set you up to achieve your best results in every area of life.